The Wades live in a smaller community which is isolated somewhat from the nearest big city by a mountainous 65 mile drive through National Forest where many of the grades exceed 6% and the altitude change is about 5,000 feet. Since they spend most of their time near home, an all electric car (EV) will be perfect for their everyday driving. For commuting to the City and for long trips, the second car will be a plug in hybrid which has the range to reach any destination. Though the cars are not yet available, the Wades wanted to be ready for them and be able to reap the benefit of solar power in the meantime. We sized the solar system to charge booth vehicles using specifications from manufactures introducing both Electrics and Plug-in Hybrids. We then set up the wiring so that there are two blank positions in the electrical box - one to provide a dedicated circuit for each car. So, now they are ready to drive on solar power the minute production cars hit the market. When it came time for final design, we found that there was more roof space than we expected and that we could face the panels two different directions without negatively impacting production or requiring a second inverter. Therefore, we upped the capacity of the system so that even when both cars are taking charge, their home's carbon foot print is still reduced by the amount required by Kyoto. The Wades financed their new system with a home equity loan. The plan was that the savings in electricity costs (before the first car arrived) would be greater than the monthly payment on the loan. In six months of operation, this has been born out - the system was a cash saver the moment with was switched on. When the cars arrive and the solar electrons begin replacing $2.00+ per gallon gas; the savings will increase as drastically as the carbon foot print and the contribution to OPEC will fall. 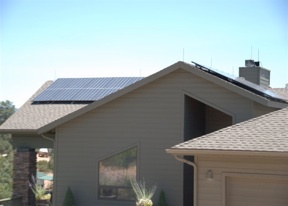 The installation was handled by American Solar Electric of Scottsdale AZ. The majority of the 30 panels face south with the rest facing southwest. These are the 5 banks of South facing panels. Because of the clear air and cool temperatures at 5,000 feet, they are very efficient. You can see the fourth and fifth banks to the upper left of the photo. These panels have a Westerly orientation. The inverter and the connection to the grid are located in the garage out of the weather - which can be severe here. The charging equipment has not yet been installed as we are waiting for the choice of vehicles. However, their station is ready for the final chargers. 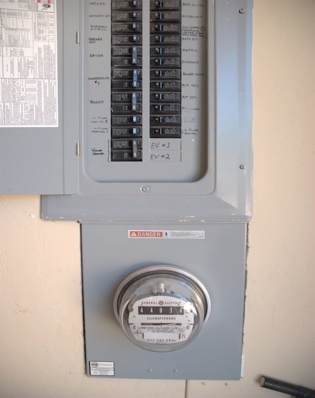 There is a meter for monitoring the power use by the vehicles and two separate circuits ready for the installation of plugs and chargers. The electrical box with the two blank circuits ready to supply chargers with solar power (these are marked EV#1 and EV#2). The meter, which will measure the car's use of power, is now being used to monitor the use of power by the upper floor of the home. The switch will be made when the first car arrives. and where placement of the car chargers is easy. The chargers can go at either end of the garage depending on where the access on the car is located. The Wades are all ready for their new cars - one Electric and the other Plug-in Hybrid. 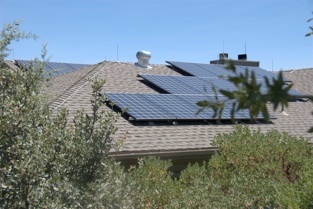 In the meantime, over 1/3 of their home's electrical load is now solar produced and due to the financing on home loan's line of credit, they are already cash ahead. As soon as their dream cars arrive, they will be Driving on Sunshine®. Note the two blank positions ready for the EV charger(s).